In a large soup or stock pan, heat 1 tablespoon of oil over medium heat. Add the onion and cook, frequently stirring, until soft, about 5 to 7 minutes. Stir in the garlic and cumin and cook for another minute. Add the vegetable broth, tomato sauce, beans, corn, stirring to combine. Bring to a boil, then reduce the heat and simmer for 10 minutes. To thicken your black bean soup, whisk together the cornstarch and water in a small bowl. Bring the soup back up to a boil, stir in the cornstarch and water mixture, then heat, frequently stirring, until soup thickens, about two minutes. While your black bean soup is cooking on the stove, prepare the corn chips. Pre-heat the oven to 400 F.
Place the corn tortilla strips in a large bowl and toss with the remaining 1 tablespoon oil until well coated. Place the tortilla strips on a baking sheet and cook until golden and crispy, about 10 minutes, stirring halfway through to ensure even cooking. 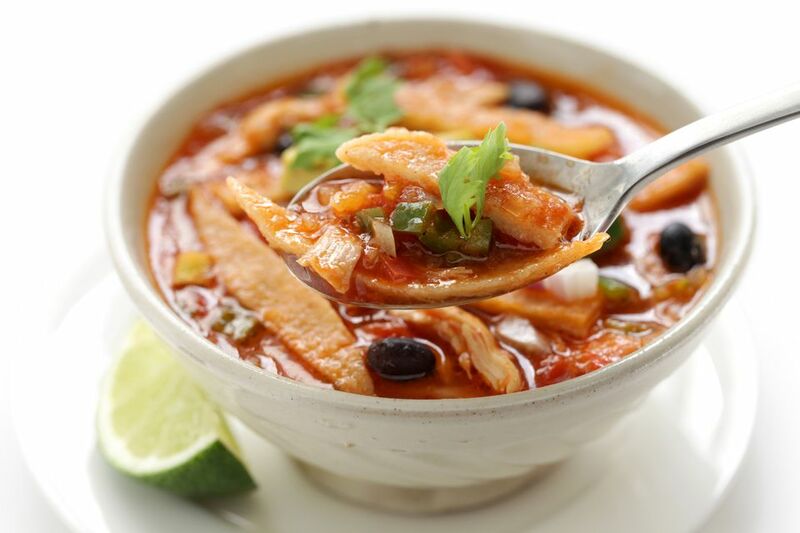 Serve your vegetarian tortilla soup in individual bowls topped with baked tortilla chips and optional cheese, sour cream, cilantro, and avocado. Top it off with cheese and sour cream, or omit the two to make it dairy-free, lower in fat, and vegan. Or, use a low-fat cheese and a reduced-fat sour cream.